Shirley Carlon MCom (Hons), CA, is a senior lecturer in the Business School at the University of New South Wales. Her teaching interests include financial and managerial accounting, auditing and tax. Shirley has considerable experience in the delivery of both external and internal programs, including web-based courses. Shirley has received a national teaching citation award for outstanding contributions to student learning for innovations in curriculum development and the creation of peer support mechanisms for off-campus students. She has taught extensively in China and has been a guest speaker on accounting issues at government functions. Shirley’s research interests are in financial reporting where she has published several articles on peer mentoring, risk reporting, intangible assets, accounting policy choice and tax in Australian and international journals. She is a chartered accountant with experience in both large and medium-sized audit firms. national levels as well as 5 international best paper awards. Rosina’s research interests include navigating and negotiating work–life balance and gender equality. Since becoming a parent, she has been developing programs to help parents overcome the challenges of modern-day parenting using the latest research in child development. A keen researcher, Rosina has edited a book with chapters from leading minds around the world in psychology, neuro-science and biology entitled Inspired children: how the leading minds of today raise their children. Chrisann Palm is a lecturer in accountancy at Queensland University of Technology. She is a CPA and has a PhD (QUT), a Master of Commerce (CSU) and a Graduate Diploma in Management (AGSM). She lectures in introductory accounting, management accounting, superannuation and personal financial planning. Prior to joining the tertiary sector in 2004, Chrisann worked as a management accountant for a manufacturing company in Hong Kong as well as in the financial services industry in Sydney. Chrisann is passionate about teaching and learning. She was awarded the QUT Vice-Chancellor’s Performance Award 2009 in teaching excellence. Her research interests are in the areas of accounting education, financial literacy and superannuation where she has published numerous articles in Australian and international journals and has received several grants and awards. Lorena Mitrione BCom, MBus, PGrad DipEc&Comm, is a lecturer in accounting at the Monash Business School. Prior to joining Monash in 2009, Lorena worked at CPA Australia. From 2001 she was the CPA Program Manager responsible for the development and maintenance of CPA Program materials and examinations. 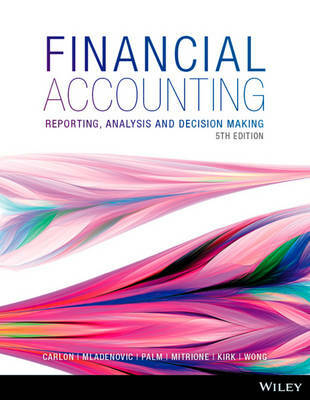 In this role Lorena developed a sound sense of the requirements for accounting learning materials while maintaining an up-todate knowledge of accounting standards, accounting research, technical accounting matters and business practices. She is currently enrolled in a PhD. Her thesis title is ‘Motivation and self-regulated learning processes applied by accounting students in a blended learning environment’. Ngaire Kirk BBS, BBS (Honours), MBS, CA, has a background in sheep and cattle farming and in the public and private health sectors. Ngaire’s teaching responsibilities include coordinating and teaching introductory and intermediate financial accounting papers and teaching advanced auditing. Her research interests focus mainly on financial accounting, financial reporting and accounting education, in particular the use of electronic and online resources to enhance both internal and distance learning. She is a member of two key Massey Business College committees whose role is to enhance assurance of learning, and teaching and learning development across the college. Lily Wong BBus, MBus, PhD, CPA, is an associate professor in the College of Business, Victoria University, Australia. Lily is a recipient of international best paper awards, as well as university and national teaching excellence awards for her contribution to student learning in accounting education. Lily’s key research interests relate to improving the learning experience and academic outcomes for first-year accounting students. Current areas of interest include blended learning, development of online teaching resources and examining the impact of technology-enhanced teaching options on student learning outcomes.